Mark the date in your diaries – Walter & co can now confirm that Roadburn Festival 2016 tickets will go on sale on October 2, 2015. Three-day (Thursday – Saturday) and four-day (Thursday-Sunday) will be available to purchase from 9pm CET via Ticketmaster.nl for €165 and €185 respectively. Day tickets for Sunday only will be available, priced at €39. A limited number of individual day tickets for the remaining days will be released for sale at a later date. With a sonic arsenal behind them that covers a broad spectrum of emotive intricacies, AMENRA are perfectly placed to showcase their diversity at Roadburn 2016. The performances at Roadburn are currently the only planned live outings for AMENRA in 2016: an acoustic set, with an expanded band of musicians, immediately before Neurosis on the Saturday, and again taking to the main stage on the Sunday night to play an electric set. To find out more about AMENRA at Roadburn 2016, click HERE. Breathing new life into one of doom’s most enduring legacies, THE SKULL will also play Roadburn 2016 twice. On Thursday, April 14 THE SKULL will perform songs from For Those Which Are Asleep (out on Tee Pee records), plus classic Trouble, 90s era tracks. The following day, the band will hark back to Trouble‘s Metal Blade years, only playing songs from Psalm 9, The Skull and Run To The Light. To find out more about THE SKULL at Roadburn 2016, click HERE. To find out more about GREEN CARNATION at Roadburn 2016, click HERE. Walter & co are elated to announce the international return of Belgium’s legendary riders of the apocalypse, LA MUERTE, at Roadburn 2016. LA MUERTE‘s massacre thrashed Europe and the UK in the 80’s, resulting in a John Peel Session at the BBC, full pages of interviews in Melody Maker, and, infamously, bomb threats in Paris by extremists French Catholics for the track Ecoute cette Prière, before eventually disbanding in 1994. They will make their highly anticipated return at the 013 venue, for eager fans at Roadburn. Denmark’s OF THE WAND AND THE MOON has become a leading staple of contemporary neofolk; albums such as 2011’s The Lone Descent are widely regarded as masterpieces. Heavily thriving on Nordic mythological influences, with lyrics mainly in Danish and English, Kim Larsen’s melancholic, often acoustic take on the genre paints devastating portraits of irreconcilable loss, love and death in a traditional romantic sense. OF THE WAND AND THE MOON will play Incubate Festival in Tilburg this month. To find out more about their performance at Roadburn 2016, click HERE. Over the past two decades DER BLUTHARSCH AND THE INFINITE CHURCH OF THE LEADING HAND‘s Albin Julius found his alchemical, musical perfection: parts krautrock, psychedelia, and dark experimentalism. Theatrical and tense, sonically dark and perverse, ritualistic and confusing – don’t miss out on Albin Julius’ mushroom aesthetics on Thursday, April 14, when DER BLUTHARSCH AND THE INFINITE CHURCH OF THE LEADING HAND will celebrate their 20th anniversary. To find out more about their performance at Roadburn 2016, click HERE. Uncompromising, unsettling, utterly confounding, and heavily funeralizing Black Metal, London’s LYCHGATE – with Esoteric‘s Greg Chandler on vocals – know how to craft a vibe. Let LYCHGATE drag you deeply down the rabbit hole on Friday, April 15, when they play An Antidote For The Glass Pill in full, and employ the church-organ to full effect on stage for the first time ever. To find out more about LYCHGATE at Roadburn 2016, click HERE. CHAOS ECHOES create an aesthetically complex body of work that sweeps death metal into a black hole of deconstructed improvisations, so if you, as most of the Roadburn crew, like to step into the unknown, then simply catch their performance on Saturday, April 16 at the 013 venue. To find out more about CHAOS ECHOES at Roadburn 2016, click HERE. Walter & co at Roadburn are ecstatically proud to unveil the official artwork for Roadburn Festival 2016, lovingly wrought by acclaimed comic-book illustrator BECKY CLOONAN – who will be following in the illustrious footsteps of such predecessors as Michel Langevin, Costin Chioreanu, and Arik Roper. CLOONAN‘s mix of clean, bold lines mixed with subtle intricacies, Manga-influenced angularity and artful use of chiaroscuro and colour has marked her out as an artist to pay serious attention to. Having provided stunning illustrations for a new edition of Bram Stoker’s immortal Dracula, collaborated with My Chemical Romance frontman Gerard Way on the art for his Dark Horse miniseries The True Lives Of The Fabulous Killjoy, and become the first woman to draw DC’s Batman – CLOONAN has already left an indelible mark on the comic book world. Her intricate linework, art-deco sensibilities and dark psychedelic edge make her the perfect match for Roadburn, with her comics background providing a fresh edge to the Roadburn aesthetic. She’ll be providing the official poster art for Roadburn 2016 along with four individual day posters – yet to be revealed – and taking part in the official exhibition of art at Projectspace Tilburg – Gust van Dijk. 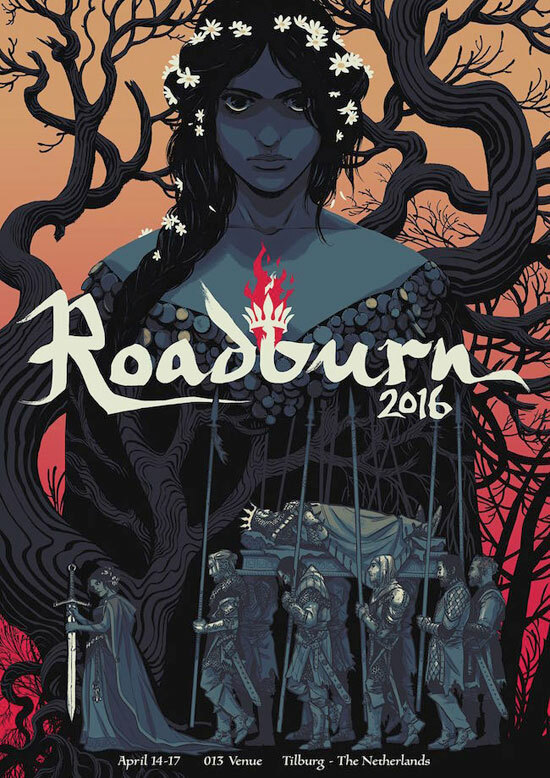 To read more about BECKY CLOONAN at Roadburn 2016, click HERE.